Being the total loser I am and not being able to get a real girl, I made this project to show I can at least bang bits. Basically this is a software UART. Instead of using the UART built into the Atmel Atmega8 chip to output a message to a computer over the serial port (rs232) I wrote code to program the start bit, data bits, and stop bit. This is what's known as bitbanging. Btw, this code could have been done a little simpler.. for example by combining TX_BUSY and TX_STATE, but I don't feel like working on this anymore. I have some other projects that use the same concepts on my website including bitbanging on an FPGA, Sony SIRC communcation, Samsung remote control, and some others. So for anyone not familiar with UARTs or rs232, here's a small explanation of what's going on here. Basically there are two hardware components here. 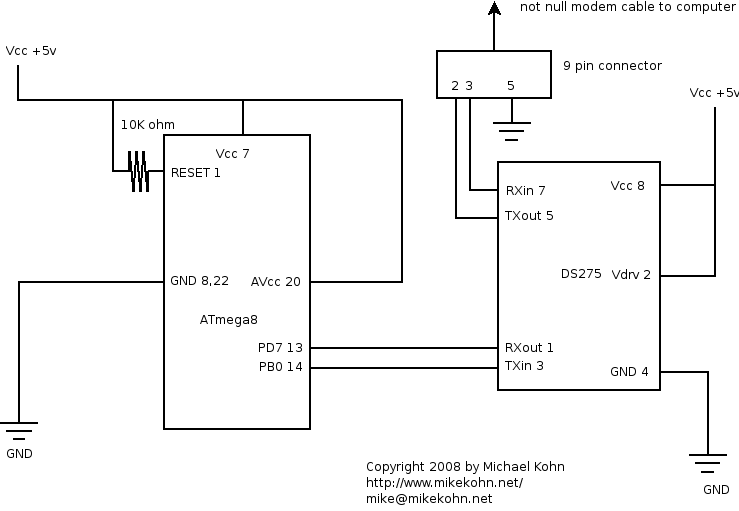 The microcontroller which outputs voltages 0 and +5 on data pin PB0 and the DS275 which converts the TTL serial voltages to standard rs232 which a typical PC would expect. Using TTL voltages 0v = 0, and 5v = 1. With rs232, +3v to +25v = 0, and -3v to -25v = 1. Note that we shift the binary code for A in reverse order (aka, least significant bit first) and the start bit is always 0 and the stop bit is always 1. Now all we need is a timer. I'm running my circuit here at 4MHz and want a baud rate of 1200 so using 16 bit TIMER1 on the Atmega8, I can calculate 4,000,000 / 1200 = 3333.333 cycles per bit. Therefore we set TIMER1 to interrupt every 3333 cycles to possibly change the state of PB0. It can also be written that each bit is 1/1200 seconds (0.833ms) in length. Any questions? Feel free to email me. I drew a schematic here with dia: bitbanger.png.